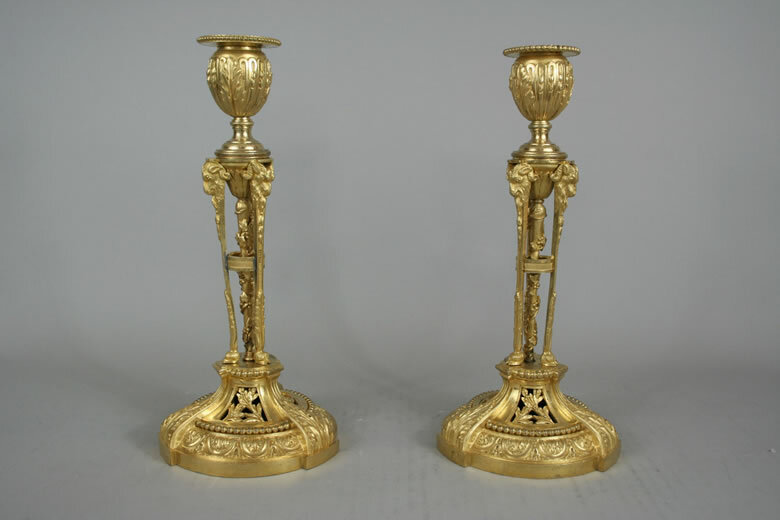 Fine and rare pair of Louis XVI ormolu candlesticks attributed to Ètienne Martincourt (ca 1735, Paris d after 1791, Paris).. The tulipform candleholder is supported by three ram headed uprights connected by a ring with a vine covered central shaft. The circular base is richly decorated with three large acanthus leaves; three reticulated laurel plaques, beading and swagged acanthus molding. ( the ribbed ring soldered on one stick; some replaced mounting screws). Martincourt, after becoming a master in 1762, was admitted to the Académie de Saint-Luc, a guild of decorative painters and sculptors.